Do I even need to review this book? Seriously. 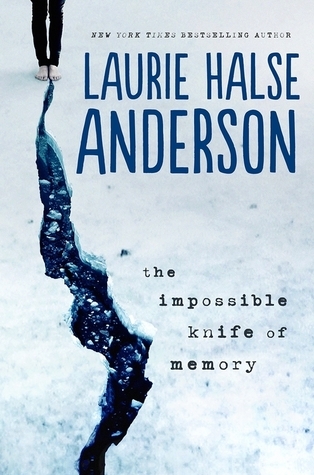 It's Laurie Halse Anderson. I mean, really. Who isn't just going to buy this book based on the name alone? Even the cover designers knew that when they made Anderson's name the most prominent feature of the cover. You know you've made it as an author with the name on the cover is more important than the title. Hayley Kincain has never been to high school before. For the past five years Hayley and her father Andy have been on the move, never settling down in one place for too long, almost as if they were on the run. In a way, they are on the run: from Andy's haunting memories of his time serving in Iraq and Afghanistan. But eventually Andy realizes the need for Hayley to have a normal life so he decides to move back to his hometown and put down roots so Hayley can attend school. Eventually, Andy's old habits get the best of him, turning to drinking and drugs to try to silence the demons that haunt both his dreams and his waking life. Hayley, too, is battling some demons of her own while trying to be strong for both herself and her father. Despite her failing grades and her "fish out of water" feeling at school, Hayley makes friends and even meets a boy who seems to be into her. But while Hayley continues to skip school and dig herself deeper into an academic hole, her father is digging himself deeper into a pit of despair and destructive behavior. Hayley thinks she can help her dad on her own, but it soon becomes clear that she needs some help. The problem is, Andy refuses to get help and his veterans benefits don't exactly make it an easy process even if he were a willing participant. But one thing is clear: if Hayley doesn't do something to change their circumstances, there isn't much hope for either her future or her father's. The Impossible Knife of Memory gives a much-needed voice to teenagers living in families with a parent battling PTSD. Its inspiration stems from Anderson's own personal dealings of her father who returned home from World War II with deep-rooted emotional scars. As Anderson said in her keynote at the ALAN workshop in November, she doesn't write contemporary fiction, she writes resilience fiction, and Hayley's story is one that adds to Anderson's canon of beautiful and important resilience literature. It is her most personal work of fiction and one that she is quite open with her readers about how the story came to be. This is a book I see winning many awards and honors as 2014 comes to a close. I feel privileged to have had the chance to read it before its official publication date. And I am ridiculously excited that Anderson is coming to Michigan as part of her book tour. Big authors just don't come to Michigan in January. I don't blame them. Who wants to possibly get stuck in a snowstorm? So it seems an embarrassment of riches all the amazing authors that are coming to Michigan next month, with Anderson being at the top of my list to go see even though I just saw her at ALAN. It doesn't matter that I just saw her though. When you have an opportunity to see Laurie Halse Anderson, you take it.